How about Ozzie Guien (sic) who now manages the WS? Orosco played here for 5 seasons! I thought Orosco was with the O's a couple of seasons? 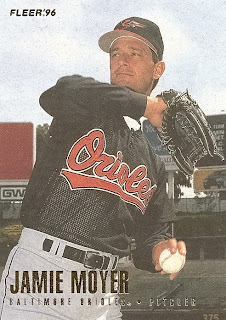 Jamie Moyer played three but I don't think anyone remembers him in an oriole uniform. Sure... if by 1-year you mean 4-years (plus a cup of coffee in another two). Woodling 3 full years, plus part of another one years before (we had him twice). I do. Other than an ocasional gem I recall like one against the WS, he pretty much pitched like Brian Burress where he would do okay for several innings before getting battered around or nibbling and walking people getting in trouble. A little more than 1 year for each of them but, yeah, you get the point. All too well. All too well. In the early 90's, I used to have a lot of these guys baseball cards. That's how I know of them. Sorry to double post, but I remember Jamie Moyer. I think I saw him pitch a game at OPACY around 1994. Yeah, half the people listed played for more than 1 year (Finley, Harnisch, Moyer). That key tidbit went out the window after about the 3rd post. Point is, Jesse is better known for his stint with the Mets or any 1 of a handful of teams than he is the Os.